Nearly every civilization makes some type of bread. Prehistoric people of 10,000 years ago baked bread. The residents of Mesopotamia, what is now Iraq, were known to use stones to grind grain to which they added water and then cooked over an open fire. Excavations of ancient Egyptian cities show that they grew wheat and barley and used them to bake flatbreads. It is believed that the Egyptians discovered leavened or raised bread accidentally when a mixture of grain and water was left in a warm place, releasing the naturally occurring yeast and producing a puffed-up dough. Before a process for making yeast was developed, bakers would often set aside a piece of unbaked dough from each batch. By the time the next batch was made, the reserved dough had soured, or fermented, by airborne yeasts. It was then mixed with fresh dough to make it rise. In 1665, an enterprising baker thought to add brewer's yeast to his reserved dough. At first, grain was manually ground by rubbing it between two stones. Then, a mechanical process was invented, in which a cattle-drive stone revolved on top of a lower, perpendicular, stationary stone. In time, the cattle were replaced by water mills or windmills. By the late eighteenth century, a Swiss miller had invented a steel roller mechanism that greatly simplified the grinding process. Commercial bakeries first appeared in the Middle Ages, as towns and villages were established. In addition to baking bread for sale, these bakeries would set aside time for people who still wanted to mix their own dough and then bake it in the commercial ovens. These were large brick ovens heated by wood or coal. The loaves were moved in and out of the ovens with a long-handled wooden shovel called a peel. It may have been the Bedouins who first made pita bread. After a long day in the sun, traversing the desert, they made camp and prepared a modest respite. Powdered grain was mixed with water to make dough which was formed into flat round loaves. The loaves were placed over the bottom of the mixing vessel and baked over an open fire. This bread was used as a utensil, as well as for food. In remote Arab villages, bread is still baked in backyard stoves. Some Arab and Israeli communities have community ovens or bakeries that set aside special hours for families to bring in their homemade loaves. When Middle Eastern immigrants began moving to the United States in large numbers in the 1970s, they introduced Americans to their cuisine. Pita bread became a popular bread choice, especially because the absence of shortening and the small amounts of sugar make it a low-fat food. By the 1990s, the wholesale pita bread market was nearing $80 million in yearly sales. Most of the pita is baked by specialty bakeries in the East, West and Midwest. Commerical pitas are typically baked with unbleached all-purpose flour or whole wheat flour. They range in size from 4-10 in (10.16-25.4 cm) in diameter. Pita bread is made by mixing premeasured amounts of flour, salt, water, and yeast. Once kneaded, the dough is fed through an extruder that forms the dough into tennis-ball sized portions. Next, the dough balls are allowed to rest and rise in a process called proofing. The dough balls pass under a series of rollers that press the dough into the desired-sized circles. The flattened dough is then passed under die-cuts that create circular pieces. ground according to the type of bread being made. Grains are composed of three parts: bran (the hard outer layer), germ (the reproductive component), and endosperm (the soft inner core). Whole wheat flour is made from the grinding of all three parts. White flour is made solely from the endosperm. Because the nutrient-rich bran and germ have been removed in the processing of white flour, vitamins and minerals are often added. Grain mills grind the flour and then sell it in bulk to commercial bakeries. The bakeries store the flour in 100,000 lb (45,400 kg) bulk silos until ready for use. Yeast is a single-celled fungus with enzymes that extract oxygen from starches or sugars present in food. This causes fermentation and leavening (rising). In commercial production, yeast strains are fed a solution of molasses, mineral salts and ammonia. After the fungus completes growth, the yeast is separated from the solution, washed and packaged. It is either combined with starch and compressed into cakes, or ground into powdered form and mixed with corn-meal. Bakeries purchase bakers' yeast in bulk from outside suppliers. The water used must be of the purest quality, not only because it will be used for human consumption, but also because the hardness and pH affect the properties of the dough. Most processors filter the water so that it is of medium hardness (50-100 parts per million) with a neutral pH. After a second proofing, the circle-shaped dough is baked quickly at a very high temperature so that the upper and lower crusts separate, forming a pocket. such as calcium propionate. Large motorized arms in the mixer knead the dough to the desired elasticity. 2 The dough is scooped out of the mixing bowl and fed into an extruder that forms the dough into tennis-ball sized portions. Each ball is then dropped into cups moving on a conveyor belt. 3 The dough balls are allowed to rest and rise in the cups for approximately 15 minutes. This process is called proofing. 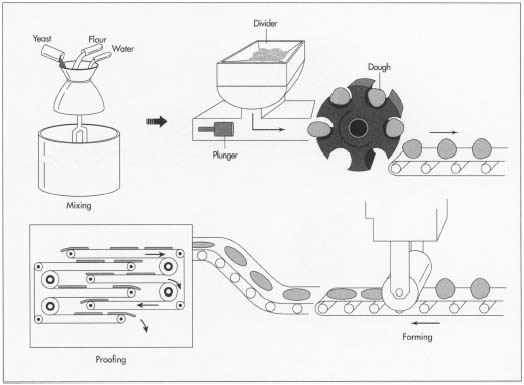 In some processing plants, the dough is allowed to proof in one continuous layer before it is cut into individual portions. 4 The dough balls are turned out onto a sheeter that travels on a linear conveyer belt. The sheeter passes under a series of rollers that press the dough into the desiredsized circles. If the dough is still in one layer, the rollers press it to a thickness of about 0.125 in (0.3175 cm). The flattened dough is then passed under die-cuts that create circular pieces. The excess dough, about 10%, is recycled back into the extruder. 5 The circular loaves move into the top shelf of a rotating proofer. As they slowly move down to the bottom of the proofer, the rises again. They exit the proofer and are conveyed into the oven. 6 The ovens are kept at a very high temperature, between 800-900° F (426.6-482.2° C). The pita loaves move quickly through the ovens where they are exposed to the high heat for about one minute. The combination of the high heat and flash-baking causes the water in the dough to turn to steam thus forming the pita pocket by separating the upper and lower crusts. 7 The baked pita loaves moves out of the oven and back and forth on a system of conveyers belt for about 20 minutes until they are cooled. Plant workers then manually flatten the puffed-up loaves. Burnt or undercooked loaves are discarded. 8 If the pita loaves are to be sliced in half, they are conveyed to slicing machines where rotating knife blades quickly slice the bread. The loaves can be cut individually or stacked in piles about six high and sliced. 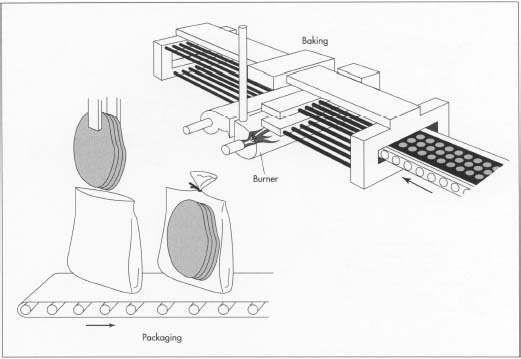 9 Whether sliced or left whole, the pita are conveyed to the packaging area where they are stacked in a pre-determined amount and inserted into pre-printed plastic bags. Workers may close the bags manually with twist ties. Alternately, the bag openings may be fitted with a zipper tear-strip, in which case the bag is mechanically heat-sealed. The packaged pitas are loaded onto trays or into cartons for shipment. If the pitas are not going to be shipped immediately, they are flash-frozen and kept in industrial freezers that are regulated to a constant temperature of about 10° F (-12.2° C). As a foodstuff, pita bread is subject to stringent government food processing regulations, including, but not limited to the percent of additives allowed, sterilization of plant equipment, and cleanliness of plant workers. In addition to adhering to these regulations, processors control the quality of their products to meet consumer expectations by installing checkpoints are various stages of the processing. At each inspection station, the pita are tested for appearance, texture, and taste. Because of its high moisture content, 38-40%, bread is particularly subject to bacteria growth. While the baking process destroys most of the bacteria, bread is still susceptible to re-inoculation of fungi after packages. There are a number of methods used to combat this including fungicides and ultraviolet lighting. Labeling regulations stipulate the plant list baking date, ingredients and weight on packaging. If the pita bread is marketed as an organic product, its processing must adhere to the Organic Foods Production Act that enumerates various requirements. Those that pertain to bread processing include prohibitions against treating seeds with prohibited materials during the growing season and strict rules for commodities grown with fungi, such as yeast. Habeeb, Virginia T. Pita the Great. New York: Workman Publishing, 1986. Pacyniak, Bernard. "Kangaroo packs a wallop." Bakery Production and Marketing (April 24, 1990): 60. "Pita sales zip along." Packaging Digest (September 1990): 42. Sobel, Dava. "The Upper Crust." Health (December 1986): 45. Leon International, division of Middle East Baking Co. http://leon-intl.com/pitabread.htm . any newly updated info on Pita sales in the US for wholesale and retail?